La Vicalanda Gran Reserva 2011. Buy wine from D.O.Ca. Rioja. Red wine Gran Reserva. 24 months in French, Allier oak barrels. La Vicalanda Gran Reserva is a red wine from the Rioja region produced by Bodegas Bilbaínes. 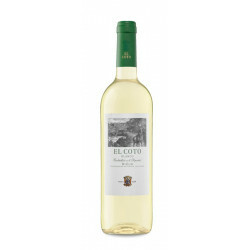 This wine is made using Tempranillo (100%) grapes, a typical grape of the region. The vineyards that produce the grapes to make La Vicalanda Gran Reserva are situated in the small municipality of Haro, a locality with a strong heritage linked with wine. The local climate has atlantic and continental influences and is perfect for growing grapes. The soils are calcareous,gravelly and poor in organic matter, all characteristics that enhance the flavor of fruit. The vines are planted using a goblet pruning system and in a way that ensures the vines maximum possible exposure to the sun. During the production of the wine, agriculture carried out is sustainably and aims to intervene as little as possible in order to not interfere with the natural processes. At the winery, the grapes, after being destemmed, are incubated and left to ferment with a long maceration. The grapes first undergo alcoholic fermentation, followed by malolactic fermentation. The second fermentation takes place in medium roast French oak barrels from Allier for 12 months on its lees. After this phase, La Vicalanda Gran Reserva is racked and is returned to the barrels where it rests for another 12 months. Before being marketed, La Vicalanda Gran Reserva is aged for 3 more years in the bottle. Bodegas Bilbaínas is the oldest bottling company in the Rioja region. Founded in 1904 by Santiago de Ugarte, the winery has the largest expanse of vineyards in the Haro locality, with their vineyards spanning 250 hectares. La Vicalanda Gran Reserva 2011 is a mature, complex and structured red wine. An excellent vintage that gave this wine the ideal balance between maturity and freshness, with just the right maturity and a good acidity for its long ageing. On the nose, the aromas of ripe red fruit stand out perfectly fused with the smoky, tobacco and roasted notes, on a very elegant spicy background. In the mouth, it is velvety, ample and with a very long finish. 2010 was considered the perfect vintage after some very good years. An optimal growth cycle, without incidents regarding the health of the vineyards. The harvest took place during a magnificent state of the vines and with a moderate production, with good fruit setting and slow ripening. A great year with excellent ageing potential, which resulted in spicy and fruity wines, with a very good structure and acidity. Rioja is one of the most important areas of wine production in the world. It has a long history, and exceptional soils and climates. From the Tempranillo and Grenache varieties they make great red wines that are masterfully aged which demonstrates the experience passed from generation to generation. Red wine Barrel Respectful agriculture. 15 months in French oak barrels. Volume: Magnum Winery: Contador. Production area: D.O.Ca. Rioja. Grapes used in this wine: Mazuela and Tempranillo. Red wine Barrel. 18 months in French oak barrels. Volume: 75 cl. Winery: CVNE. Production area: D.O.Ca. Rioja. Grapes used in this wine: Tempranillo. Red wine Reserva. 18 months in French oak barrels and 20 months in bottle. Volume: 75 cl. Winery: Vinícola Real. Production area: D.O.Ca. Rioja. Grapes used in this wine: Tempranillo. Red wine Barrel. 18 months in French oak barrels. Volume: 75 cl. Winery: Pujanza. Production area: D.O.Ca. Rioja. Grapes used in this wine: Tempranillo and Other red varieties. Red wine Barrel. 18 years in french oak barrels. Volume: 75 cl. Winery: Remelluri. Production area: D.O.Ca. Rioja. Grapes used in this wine: Tempranillo. Red wine Reserva. Volume: 75 cl. Winery: Marqués de Murrieta. Production area: D.O.Ca. Rioja. Grapes used in this wine: Cabernet Sauvignon and Graciano and Tempranillo. Red wine Reserva. 72 months in American oak barrels. Volume: Magnum Winery: Viña Tondonia. Production area: D.O.Ca. Rioja. Grapes used in this wine: Garnacha Tinta and Tempranillo and Mazuela and Graciano. Red wine Reserva. 18 months in French and Hungarian oak barrels. Volume: 75 cl. Winery: Ysios. Production area: D.O.Ca. Rioja. Grapes used in this wine: Tempranillo. Red wine Barrel Respectful agriculture. 18 months in French oak barrels. Volume: 75 cl. Winery: Contador. Production area: D.O.Ca. Rioja. Grapes used in this wine: Tempranillo. Red wine Barrel. 17 months in French and American oak barrels. Volume: 75 cl. Winery: Contino. Production area: D.O.Ca. Rioja. Grapes used in this wine: Tempranillo and Graciano. Red wine Barrel Respectful agriculture. 15 months in French oak barrels. Volume: 75 cl. Winery: Benjamin de Rotschild & Vega Sicilia. Production area: D.O.Ca. Rioja. Grapes used in this wine: Tempranillo. The century-old Bodegas Bilbaínas were born with a French heart and were established with a Riojan spirit. Bodegas Bilbaínas is the oldest bottling firm in La Rioja. It is the winery with the largest surface area of underground caves ("calados") in the whole region (3,400 m2). It also has the most extensive area of vineyards in the municipality of Haro. Since the beginning, the winery has been defined by its deep knowledge of the territory and the care in the production of its single-vineyard wines. These are extremely identified with the plots where they came from, hence their names: in 1911 Viña Pomal was created; in 1921, Viña Zaco; in 1923, the white wine Viña Paceta; and the range was extended in 1994 with La Vicalanda reserva, a distinguished and expressive wine that was born from the 9-hectare farm, selected in the vineyard area of Viña Pomal. Red wine Reserva. 18 months in American oak barrels. Volume: 75 cl. Winery: Bodegas Bilbaínas. Production area: D.O.Ca. Rioja. Grapes used in this wine: Tempranillo. Red wine Reserva. 20 months in French and American oak barrels. Volume: 75 cl. Winery: Bodegas Bilbaínas. Production area: D.O.Ca. Rioja. Grapes used in this wine: Garnacha Tinta and Graciano and Tempranillo. Red wine Reserva. 14 months in French oak barrels. Volume: 75 cl. Winery: Bodegas Bilbaínas. Production area: D.O.Ca. Rioja. Grapes used in this wine: Tempranillo. Red wine Gran Reserva. 36 months in American oak barrels. Volume: 75 cl. Winery: Bodegas Bilbaínas. Production area: D.O.Ca. Rioja. Grapes used in this wine: Tempranillo and Graciano. Red wine Barrel. 4 months in French and American oak barrels. Volume: 75 cl. Winery: Bodegas Bilbaínas. Production area: D.O.Ca. Rioja. Grapes used in this wine: Garnacha Tinta and Tempranillo and Maturana and Mazuela and Graciano. Red wine Barrel. 10 months in French and American oak barrels. Volume: 75 cl. Winery: Bodegas Bilbaínas. Production area: D.O.Ca. Rioja. Grapes used in this wine: Garnacha Tinta. Red wine Barrel. 20 months in French oak barrels. Volume: 75 cl. Winery: Bodegas Bilbaínas. Production area: D.O.Ca. Rioja. Grapes used in this wine: Graciano. Red wine Barrel. 20 months in French oak barrels. Volume: 75 cl. Winery: Bodegas Bilbaínas. Production area: D.O.Ca. Rioja. Grapes used in this wine: Tempranillo.